The Senior Associate Athletics Director at the University of Dayton discusses the operations of the three-phase, multi-level transformation. How are you preserving the energy and the passion that already exists in this arena, while also making sure that you're bringing it up to modern standards? The energy of the arena really creates itself. As we started this process and did focus groups with our season ticket holders, the biggest thing that we heard from them was “Don’t mess with the soul of the bowl.” So we identified a need to create better fan amenities and better code options for them, but at the same time, keep the integrity and the energy inside the bowl. What has the NCAA told you was most needed? What improvements are you making to continue getting the First Four games of the NCAA Tournament? We like to call ourselves the epicenter of college basketball. Our attendance numbers over the years, not only for our men’s basketball games but also the NCAA First Four, have proven that. But as we started this process, we talked to the NCAA and some of our other long-term partners. We asked them what features will help keep [the First Four] in Dayton or help us moving forward. The NCAA provided us nine items, everything from upgrading the locker rooms, to more premium seating, to some more flexible areas. We've incorporated all of those into this project. Walk us through some of the best elements that you see coming online. The biggest one is obviously circulation. Anyone that’s walked around during a game knows that we have a couple of little choke points where it’s been a bit of a log jam. Fortunately, our fans know the paths and ways to navigate around those. But during this project, we’re adding 55,000 square feet of concourse space. So whereas before, we had 85% of our concession stands and 100% of our restrooms in just the east and west wings, we’re now breaking it into quadrants, and we have them equally distributed along our 360-degree concourse. What are you installing in terms of technology to improve the fan experience and operational efficiency of the building? We started with the infrastructure. We rewired the whole building. It’s television-ready, including new drops and other details around the building. That was done in the first phase along with our center-hung scoreboard and our LED ribbon boards on the ends. That really set the tone for us. During these next couple of phases, we’re updating the rest of our infrastructure, and we’re hoping in the final phase, we will install new Wi-Fi throughout the whole bowl and the concourse to give fans the experience that they want. How about food and beverage? What are some of those changes and improvements being made, both on the general concourse and the premium level? We’re working closely with our dining services, which handles all of our premium seating. We handle all of our concessions in-house. We have the same number of stands, but we’ll have more flexibility in those stands, being able to offer a wider range of food, some healthier foods that people are requesting. In addition, we’ll also be able to have more portables around the concourse with the expanded space. This renovation is being completed in three phases, and the project will be done next November. What’s the current budget? Right now, it’s sitting around $74-$75 million. What will be your favorite area? I’d say the expanded concourse. There are plenty of times during halftime or towards the beginning or end of a game when the concourse is really tight. I have the advantage of going outside and around to get to the other side of the arena. Now I won’t have to do that. I can just navigate through the natural concourse. As far as ingress, egress, entrances, exits, getting people on and off the highway, can you touch on any of those elements? We’re fortunate that we’re right next to I-75, so it’s a quick on and off for people. As far as coming in and out of the building, we are maintaining entrances on all four sides. A nice feature we’re adding is vestibules in each of those locations, so in the wintertime, cold air is not blowing straight into the arena. The signage and circulation improvements will help with those considerations as well. Where do you hope to see this arena 10, 20, 30 years from now? We’re hoping that we’re still hosting the First Four in the epicenter of college basketball. And one of the elements that we are adding is climate control, which [UD Arena] has never had in its 50-year history. With that, we’re hoping to do a lot more events in the summertime, whether they’re collegiate events or community events. Expanding our number of events every year will be a great plus. Last question, what's your favorite event that's been here at the arena? I have to say the NCAA Tournament. It’s the fun one because it’s such an adrenaline rush from six o’clock on Sunday night when we find out what teams are coming to potentially just four hours later, like we had last year, with a team on-site. They knew they were coming here and were bussed up and ready to go. Those four or five days are a lot of fun, but it’s 360 days of planning. 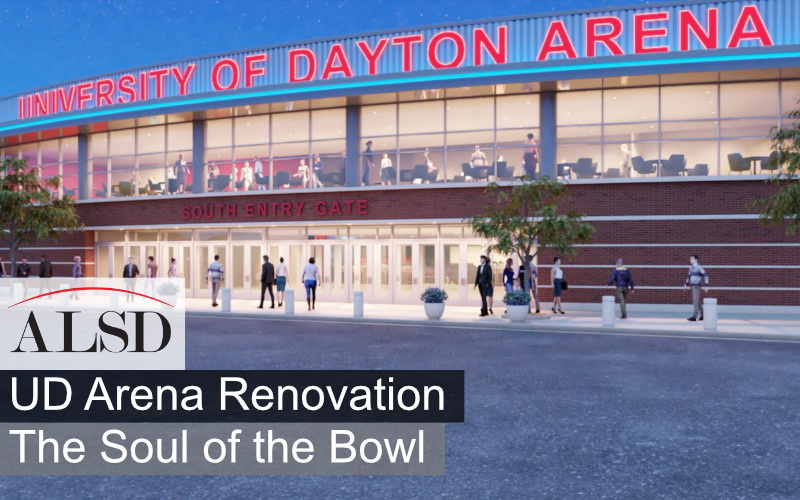 Watch our entire video series chronicling the three-phase renovation to UD Arena which includes a behind-the-scenes hard hat tour and exclusive interviews with project stakeholders key to its architecture, operations, and premium seating.